Faced with the problem of finding a way to shape safely the sculpted, concave form on the sides of my teak casket, I resorted to making a special plane with a curved sole. Use of this made the whole process relatively easy. The plane described here adopts the same laminated technique as used by James Krenov, but with some significant differences. 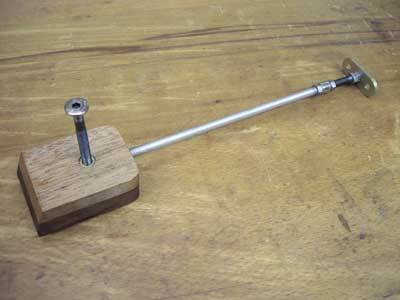 I have added a separate sole - although Krenov does advocate this in The Fine Art of Cabinetmaking, but seems to prefer to use planes without a separate sole - and a cap iron made from brass, as well as an adjustable mouth, highly desirable in a wooden plane. The separate sole allows the main body of the plane to be made from an easy-working offcut; the sole, usually made from something obscenely hard and difficult, is then glued in place. The traditional material for this job has always been lignum vitae (Guaiacum officinale) which is the heaviest known timber and which also has the very useful property of being self-lubricating. However, it is difficult to obtain in long lengths so I've used some greenheart (Chlorocardium rodiaei) which at 70lb/cu ft is almost as hard. The brass cap iron affords a more controllable and firm pressure onto the blade by way of the mechanical advantage of the lever action, especially close to the cutting edge which is where it's needed. 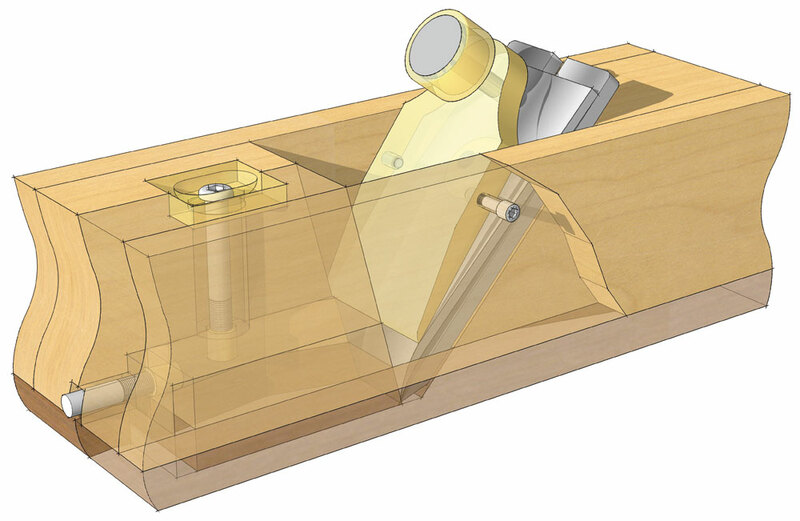 Begin by making a full-sized sectioned drawing of the plane to include the thickness of the cutter and the position of the brass cap and bolt. This will enable you to measure the correct distance between the front and rear parts, photo 2, at the gluing stage in addition to finding the exact point where the brass cap will pivot. 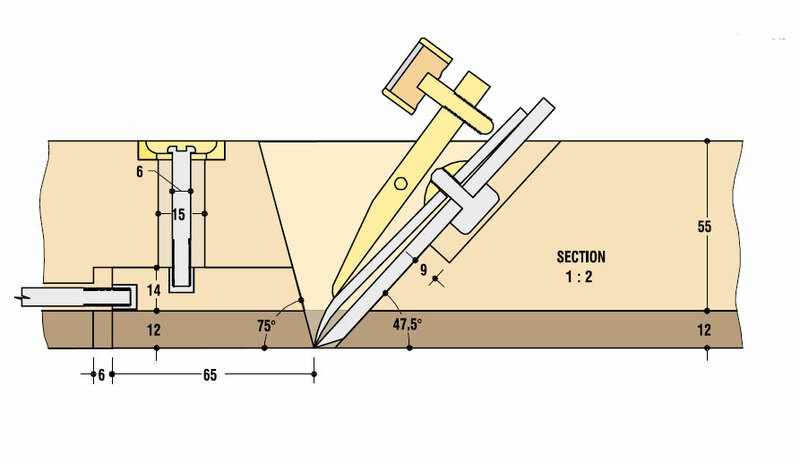 Make another drawing to show the position of the exit point of the cutter through the sole so that the correct proportion between the front and rear parts of the plane can be established. 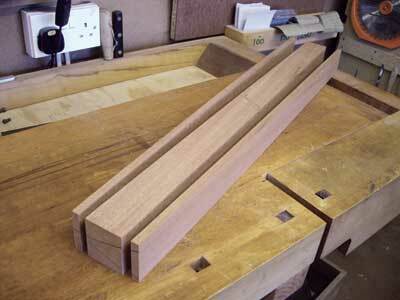 The material, a length of mahogany (Swietenia macrophylla) should at this stage be overlong. Machine it to size and remove two slices, photo 3, one from each side, then plane all three again to the correct thickness; machine the centre section 2mm wider than the cutter and, most importantly, square. Next, produce the escarpments at 15 degrees and 47.5 degrees, photo 4, so that the main block is now in two pieces. This plane has an adjustable mouth so the next stage is to machine a groove in the front block for the studding, photo 5, and drill a 15mm hole for the mouth locking bolt, dimensions for which can be obtained from the sectioned drawing. 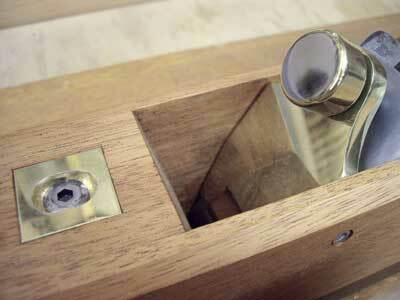 The top surface of the front block has a square recess chopped out so that the brass fitting, photo 6, is a snug fit over the top of the 15mm hole. 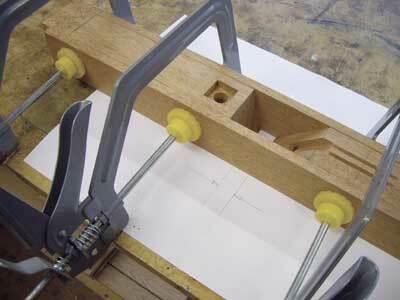 Mark out all four pieces for gluing, ensuring that the correct distance is obtained between the front and rear sections with all dimensions, photo 7, taken directly from the drawing. I use several small dowels - in this case little bits of bamboo skewers - to locate the sides, photo 8, in the correct position, after which they are glued and cramped, photo 9. 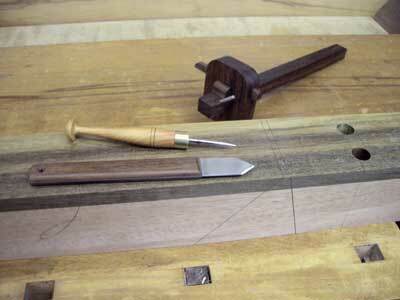 Clean up the mahogany block all round with a long plane, photo 10, and cut to the right length. It's important at this stage that all surfaces are made true and square, as the pivot points for the brass cap will need to be very accurately marked out later. Glue the greenheart sole in place, then rout away any waste. 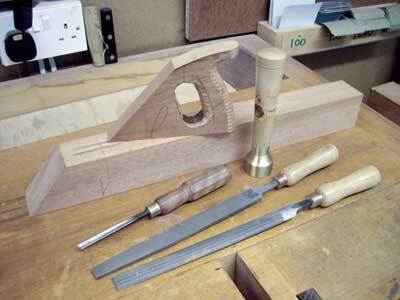 The tote is based on the shape of the one on my Norris A1 panel plane, photo 11, although any shape of handle is easy to make and can be cut and shaped using bandsaw, rasps, files, seen in photo 12, and sandpaper. Biscuits are used to join the tote to the main body which is then cramped dry in the vice and the groove for the chipbreaker bolt routed. It's useful at this stage to fix an oddment with some double-sided tape, shown hatched in photo 13, to the side of the tote to make a single surface for the router fence to run against. 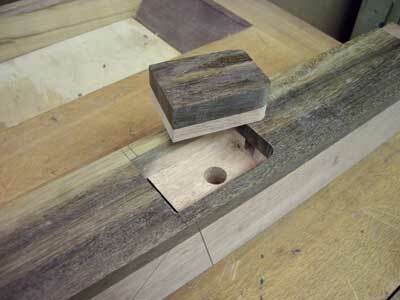 The area for the mouth is now carefully marked, photo 14, and routed out, after which the separate mouth insert, photo 15, is made from an oddment of greenheart and mahogany. 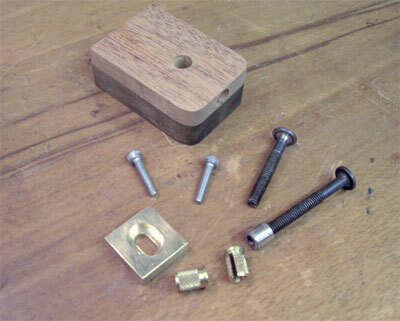 Two 6mm brass threaded inserts are now epoxied into the insert, one for each of the threads needed, photo 16. These may need to be cleaned out afterwards with a 6mm tap so it's a good idea to make the initial hole longer than needed. The mechanism for the adjustment of the mouth is a fairly simple affair and is made from a couple of 6mm bolts and some studding, cut to the correct length. 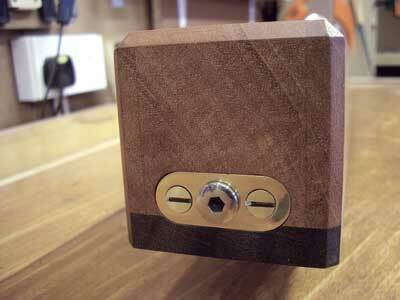 These are held together with a threaded collar and a couple of lock nuts, photo 17, each side. 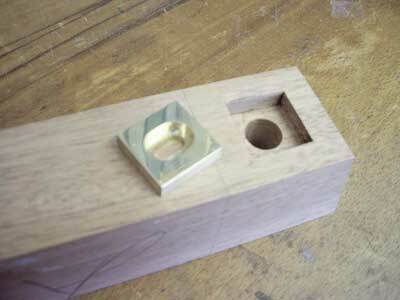 The square brass insert on the top of the plane was machined for me by my good friend Pete Newton and is made from 6mm stuff with an elongated hole milled into the surface. 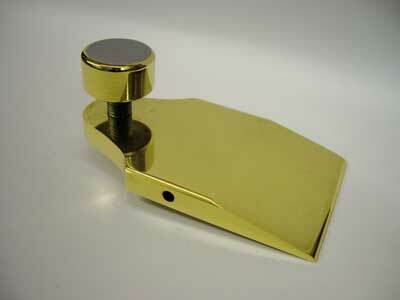 Make the oblong brass plate, photo 18, then rout out the front of the plane to the correct depth. It too is locked in place with a pair of nuts tightened against each other so that the complete thread is easy to turn. I happened to have a pair of bolts with a hex machine screw head adjusted with an Allen key, but any suitable bolts will suffice. The cap is made from some 8mm-thick brass and is cut to shape by chain drilling, photo 19, and hacksaw - a new blade in your hacksaw is an excellent investment as cutting brass this thick with a blunt blade is nothing but sheer hard work! After rough cutting, use a disc or belt sander to smooth the straight sections, making sure that the extraction to the machine is NOT switched on as any red-hot brass particles that are sucked into the bin could very easily start a fire - much better here to use a simple mask instead. 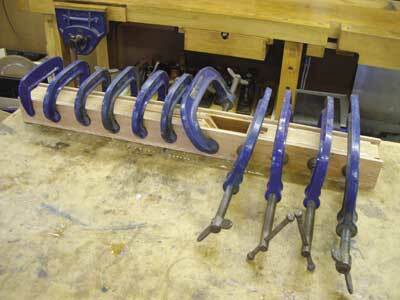 Files are used to smooth the curved sections after which wet-and-dry paper is used down to 1000 grit. The M4 blind pivot holes are then marked out, drilled and tapped after which the M8 hole, photo 20, in the top surface is made. The completed cap, photo 21, is then finished on the leather wheel of a Tormek-type grinder with a suitable buffing compound. 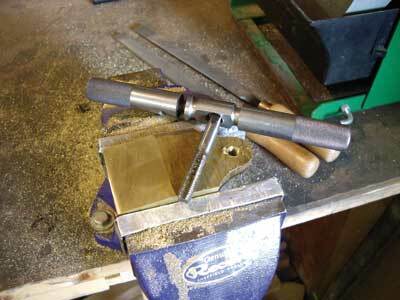 The brass cap pivot bolts that I use are M4 machine screws with a cylindrical head. 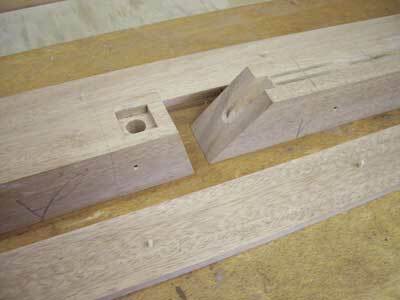 The location for the counterbored pivot holes on each side of the plane can now be marked out, making accurate reference to the drawing to ensure that the holes are made in exactly the right position. If the holes are even just the tiniest fraction out the brass cap will be 'skewed' when it is finally fitted, photo 22, hence the reasoning to keep the plane body dead square at all times to ensure accurate marking out. 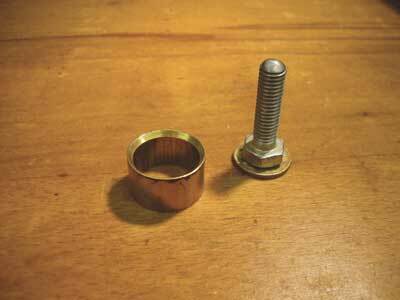 An 8mm bolt is used with the brass cap; however, the really clever bit is that it is encapsulated with epoxy in a 22mm turning ferrule. The shiny silver top is a foreign coin, photo 23, that is an exact fit in the ferrule. Start by cutting a bolt to the correct length and doming the cut end, then superglue in the exact centre of the coin, place it inside the ferrule and fill this with epoxy adhesive. Leave overnight to set. The bolt can be shaped by holding it in a cordless drill by the thread and rotating it against the direction of cut of the disc sander, after which it is put into the pillar drill and again polished to 1000 grit. 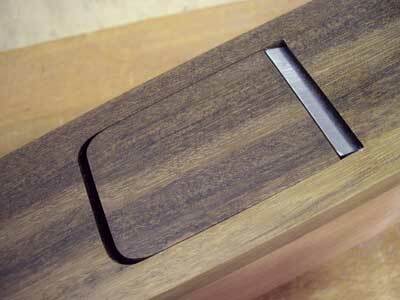 Perhaps the single most important part of making a plane this large is to ensure the sole is dead flat. In this instance the sole was very slightly convex so whisper-thin shavings were taken off with the longest steel plane available, necessitating constant reference with a very long straightedge to make sure that the sole was true. This process takes a little while as only a few shavings can be taken before the greenheart dulls the blade; it's so hard that it simply won't cut with anything resembling a dull blade. 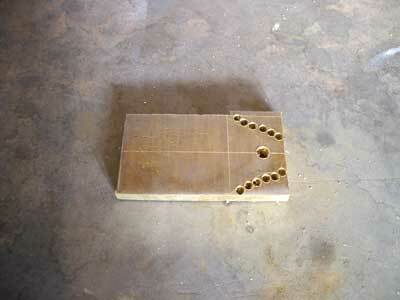 Once the sole is flat, sand it with 150 grit paper secured to the surface of the 10mm-thick float glass in the jig. 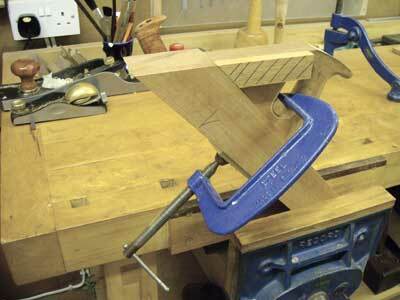 Shorter-length plane soles can be trued by going straight onto the jig without planing. 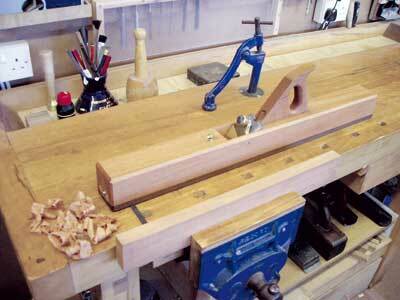 Clean up the plane with a finely set smoother, sand to 320 grit and glue the tote in place. Next, assemble the adjustment mechanism and cap, hone the blade and insert it carefully. One of the main benefits of this plane is that the mouth can be adjusted to be extremely small, photo 24, so that a very, very fine silky shaving emerges, photo 25. Two coats of matt Osmo Poly-X Waxoil followed by a good application of Alna Teak Wax result in a pleasant dull lustre. "This plane can be adapted to taste by altering the various parameters without changing the basic making method"
This plane can be adapted to taste by altering the various parameters without changing the basic making method, and of course there's no need to have an adjustable mouth. The blade here is a 5mm-thick parallel double-iron from an old coffin smoother and is pitched at 47.5 degrees. It has also been cut down in length to about 110mm and ground to a width of 44mm, and is being used in a plane with a total length of 710mm, making it a extra-long jointer. 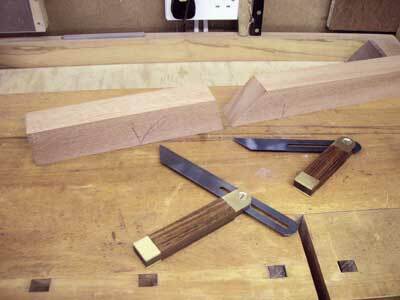 Having used these old jointers in the past I always found them too cumbersome to hold comfortably with blades that were approximately 65mm wide so I wanted to make something with a narrower blade which would allow it to be easily gripped with the left hand. You'll need a cordless drill, a disc or belt sander, a pillar drill and a set of 4, 6 and 8mm taps and a tap wrench. 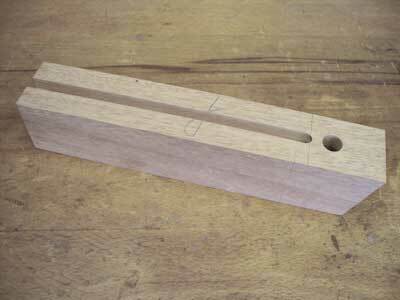 I made a jig to flatten the sole, and this can also be used to fettle the soles of metal planes as well as to prepare the undersides of any other wooden planes that you make. Wooden planes of all description have been around for centuries. They can still be bought from boot fairs and second-hand tool shops for next to nothing, but will usually need some work on them to make them 'sing'. 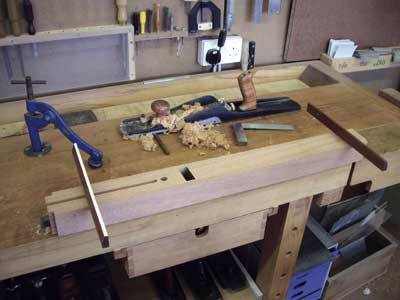 One of my bench planes is the traditional 17in-long wooden jack with a 2in cutter that can remove shavings as thick as a leather belt with a well-sharpened iron. I certainly wouldn't be without it and I suspect many others feel the same. These traditional planes, though, are all made from a single timber, usually beech, and have the iron located by a wooden wedge. They were gradually superseded throughout the late 19th and 20th centuries by the emergence of the cast-iron, fully adjustable, Bailey-pattern plane made popular by Record and Stanley. Very recently, firms like Clifton, Lie-Neilson and Veritas have started to produce exceptional high-quality metal planes. Of course, if you're a National Lottery winner and woodworker to boot, you are very firmly pitched into the realm of hand-made offerings from Karl Holtey, Konrad Sauer and similar bespoke makers whose planes are unfortunately well out of the reach of mere mortals. So why, you might ask, are wooden planes still used when there are so many excellent products available to suit all tastes and pockets? My own personal view is that a certain James Krenov has made them popular over the last 30 years. 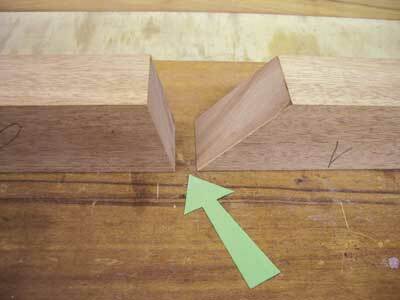 Their simple wedged and laminated construction means they are relatively easy to make but that's not the whole answer. Wooden planes allow the user to make a tool that will glide beautifully over the timber and cut whisper-thin shavings if needed. Any length plane can be made, using a double or single cutter, pitched at any angle to suit the timber and with any shaped sole, and they are so cheap to make, this one cost about £2 - for the machine screws and studding - as mostly everything else was to hand. These planes are great fun to make and the whole job can be done for next to nothing. Any size or shape can be produced, curved sole or flat, open or closed tote or even no tote at all, single or double iron set at any angle; it all depends on how you want to produce the plane and it's ultimate use. 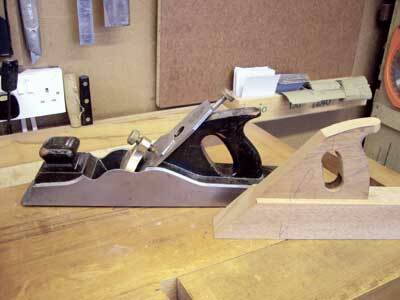 Then again, if you don't want to make your own wooden plane, it's very useful to know a man who does.